Nearly a dozen RVs line Latham Street in Mountain View, filled with families who found an alternative to rising rental prices in Silicon Valley. But one couple's antique RV stands out from the rest. 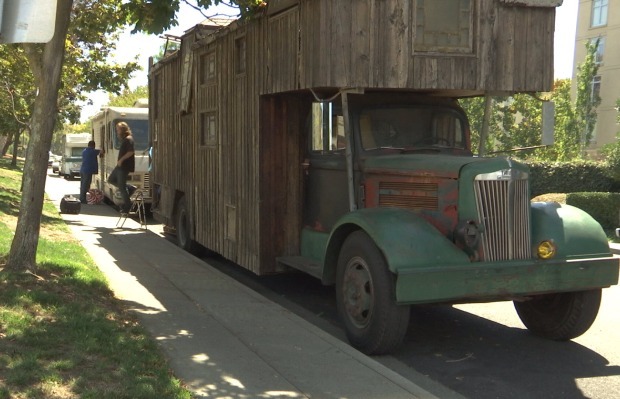 The decades-old vehicle is made from wood and other recycled materials, and has been parked in the area now for a few weeks. "This one fits our personality," said owner Justin Harper. "The inside is a lot more spacious than a lot of RVs actually." Harper and his partner Nicole Mensick purchased the RV in Stockton for $2,000 in January. The couple had been living in their SUV and moving cities every three to four days and decided an RV would give them more space and freedom to travel. "We haven't found where we belong yet," said Mensick. "And we want to find that." The couple says the original owner bought the RV for $200 back in the 1960s. She lived inside with her husband and four children. The RV has two beds and space for a third, plus a loft area, small sitting space, and pad for their dog, Tina. It features a stove and a full shower, but no electricity. The couple uses candles to light up the space. The RV is parked near Target where police have allowed the couple's RV and others to stay. They are not allowed to park the mobile home in privately-owned parking lots. Harper and Mensick created a GoFundMe campaign to raise money for truck and RV repairs. So far they've spent $4,000 restoring the engine. Neither one is working now, but they hope to one day purchase land in a mountainous area and park the RV on their property.